June 2, 2014 · by Zack Reyes · Post may contain affiliate links. See my disclosure policy here. When we look for Ragu coupon, typically the first place we check is the latest newspaper coupon insert. That being said, there are other places where Ragu coupon are located as well. You can commonly find Ragu coupon online as well. Check here to see if there are any available from coupons.com right now. The nice thing about Ragu coupons is that pasta sauce is already relatively cheap, so you're saving even more on an already affordable product. Combine these with Barilla pasta coupons to make yourself a nice dinner for only a few bucks! Additionally, a lot of times, Ragu is on a store special or promotion where you can save money that way as well. 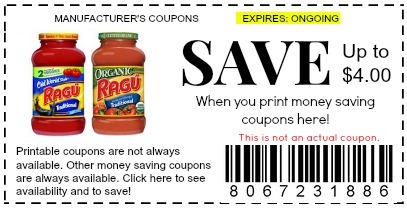 The nice thing is that you can use a manufacturer's Ragu coupon on top of store sales or promotions to save even more! I see Rite Aid offer +Up Rewards on the purchase of 2 Ragu jars quite often. Because Ragu is in the Unilever family, it gets bundled with other Unilever products for store promotions often. This is a great time to stock up on Ragu. A typical Ragu coupon will be for $0.50 or so off of one or two jars of pasta sauce. Personally, I like to get their classic red sauce and jazz it up in my own kitchen. I start with diced onions and celery, then add garlic and sautee in olive oil. Then I add a tablespoon or so of cream cheese and half a jar of sauce. I sometimes will also add fresh mushrooms to the sautee. Using the super cheap Ragu as a base for my fancy sauce allows me to get a really nice sauce for a low cost and low effort. Ragu red sauce can also be used as a pizza sauce or a dipping sauce for garlic bread or mozzarella sticks. With all that you can do with Ragu, keep a look out for Ragu coupons and print them when they are available. Then wait for a sale to save even more and create some delicious dishes on the cheap! Where have you seen Ragu coupons?